A series of high profile hunger strikes have kept India riveted for the past few months. Even as the curtains came down on Baba Ramdev’s fast unto death, news came in of unfortunate demise of one Swami Nigamananda, who was on fast since February this year but no one seems to have taken note of it till his death. Of course the most famous person to use this unique weapon of protest was Mahatma Gandhi but there were others, who are almost forgotten today. For millions of Calcuttan, his name simply means a convenient metro station – where they need to get down to reach the busy South Calcutta traffic crossing of Hazra. Not many in the crowd would be able to tell you why that particular station (or for that matter the park next to the station, as the station is actually named after the park) is called Jatin Das (Park station). In this season of high-profile fasts, I am reminded of a young revolutionary, who died in Lahore jail after a record 64-day long fast, protesting against the treatment of political prisoners in British jails. 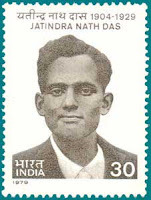 He started his protest fast (along with other prisoners) on 13th July, 1929. Authorities tried every coercive method to break their resolve, but could not succeed in feeding Jatin. He died on 13th September, 1929; he was yet to celebrate his 25th birthday. In pre-independent India, he was the only person known to have fasted to death. When his body reached Calcutta, a two-mile long procession followed the coffin. Jatin was a member of the famous Hindustan Socialist Republican Army. Three of his comrades and fellow prisoners at Lahore Jail (who also participated in the hunger strike) – Bhagat Singh, Sukhdev and Rajguru were hanged on 23rd March, 1931. Apparently Bhagat Singh and his fellow comrades were inspired by Irish Republicans. Ireland is the only other country in the world, where hunger strike is a regular method of protest. In 1920, in a widely publicized protest, Lord Mayor of Cork, Terence MacSwiney sat on a fast unto death in prison along with 11 Republicans. MacSwiney died after 74 days of fast (three other prisoners also passed away later). After Jatin’s death, his family received a condolence message from MacSwiney’s family. Perhaps, it is not wholly without symbolism that as a firebrand opposition leader, Mamata Banerjee often used to sit in protest at Hazra crossing, next to the Jatin Das Park – many would like to believe that it was actually her protest fast in 2006 against Singur, which turned the tide in West Bengal. Before Anna Hazare and Baba Ramdev, the hunger strike, which literally shook the political establishment of this country and changed the map of India for ever, took place in 1952. On 19th October that year freedom fighter Potti Sreeramalu sat on a fast unto death at the heart of Madras, demanding a separate Andhra state. Born in Madras in 1901, Sreeramalu joined railways after his education. But after losing his young wife at childbirth along with the child, he gave up his career and joined freedom struggle. He even spent some time in Gandhi ashram at Sabarmati. Even before independence, he sat on a fast demanding temple entry for lower castes in 1946 –he was then persuaded by Gandhiji himself to withdraw his fast. By 1952, movement for a separate Andhra state already gained momentum but the central government was unwilling to curve out new states on the basis of language. Even as Sreeramalu’s health started deteriorating, an unperturbed Nehru declared that he was not persuaded by fast, but only by fact. Even as the Prime Minister remained unmoved, Swami Sitaram and Andhra supporters rallied around Sreeramalu and protests movements were organized all over the Telugu-speaking areas of Madras Presidency. After 58 days of fasting, Sreeramalu died on December 15, 1952. As the news of his death spread, spontaneous protests, arson and rioting engulfed the entire state – forcing the government to grant a separate state of Andhra Pradesh and heralding an era of linguistic states. On October 1, 1953, when the state of Andhra came into being at a function at the capital Kurnool, two of the most eminent guests on the dais were Prime Minister Nehru and Chief Minister of Madras C Rajagopalachari – it was primarily their inactions, which led to the death of Sreeramalu. Gradually more and more linguistic states (Kerala, Karnataka, Haryana, Gujarat) came into being. In a way it was largely due to self-sacrifice of this man, but today people hardly remember him outside Andhra, where he is always respected as Amarajeevi(immortal)Potti Sreeramalu.